Prime your laminate cabinets for the perfect paint job with these tips for surface preparation, paint selection, and application. 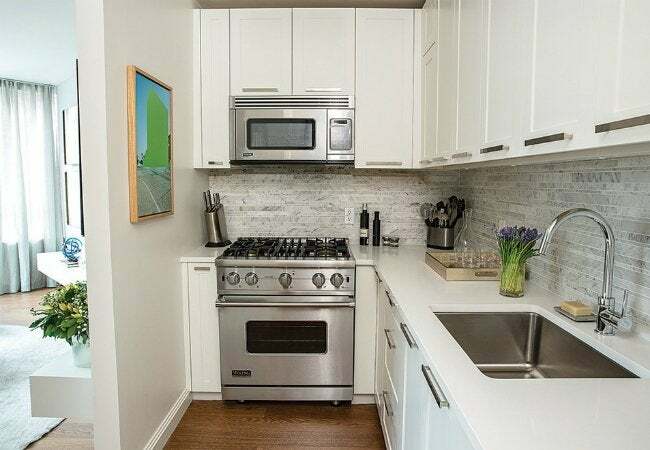 Short of committing to a more costly replacement of outdated kitchen storage, repainting laminate cabinets is an affordable way to turn the eyesore into eye-catching, modern cabinetry. But while you may be well-versed in painting most any old wood furnishings, from side tables to pantry doors, laminate is another beast altogether. Not nearly as porous as its wooden lookalike, this type of surface requires unique preparation, paint, and paint application. Follow these best practices to reinvigorate your laminate cabinetry with a fresh face that lasts! If laminate is cracked, warped, or peeling, that damage can interfere with the bonding of paint to the cabinet. Ensure that the laminate is in good condition by repairing minor laminate damage or re-facing cabinets before applying paint. Remove knobs, pulls, and other visible cabinet hardware before painting laminate cabinets for smooth paint application without obstructions. You can mask metal on the hinges with painter’s tape and paint the doors in place, or, if the hinges are visible and removable, take the doors down from the cabinets and paint them separately on a work bench or sawhorse. It may be tempting to eyeball your cabinets and decide that any dirt is minimal enough to conceal with a paint job, but your dirty secret will get out when the color fails to adhere well to the laminate. 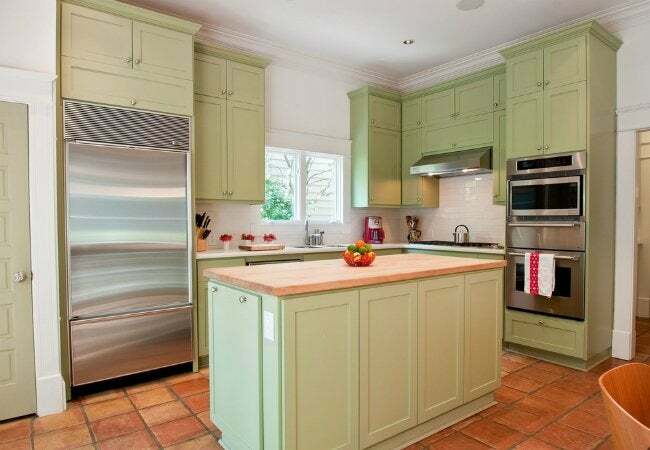 Before you start painting laminate cabinets, gently wipe away settled-on grime and grease using trisodium phosphate. Then, rinse with fresh water and dry the cabinets completely. To create a strong bond between the paint and your cabinet, you’ll need to roughen up the slick laminate with the help of a gritty companion: sandpaper. (For better coverage of a large surface area, consider upgrading to a motorized orbital sander. Your upper body will thank you.) Thoroughly scuff the surfaces of the cabinet with 120-grit sandpaper—enough to get a dusting, but not so much that you tear through the paper-thin laminate surface—and clean up any dusty remains with a handheld vacuum and a damp cloth. Laminate doesn’t play well with all primers and paints, only those specially formulated to adhere to its picky surface. If you opt for a primer, choose a bonding primer tenacious enough to stick to laminate, and then top it with an oil- or latex-based paint after the primer has cured. 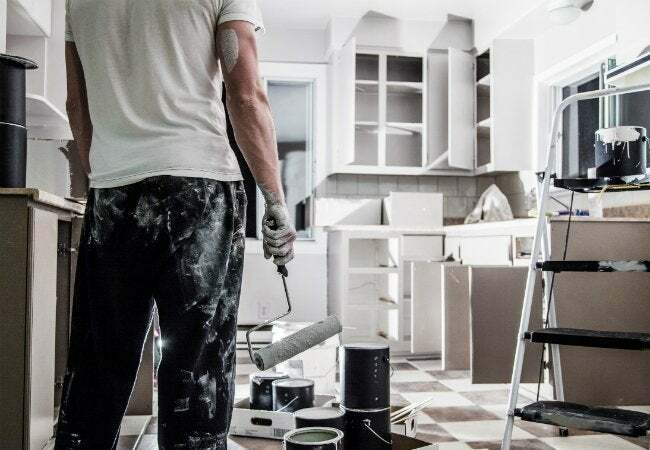 If you select a paint that can be applied directly over laminate, you can skip the primer—just know that this qualification may limit your color choices (or, at the very least, rule out using paint leftover from another household project). Paint in hand, you’re almost ready to get to work. But first, double-check that your stock is well suited for the job. Testing its bonding capabilities before diving into an entire paint job could save you from a case of peeling paint down the road—and the need to redo hours of work. Apply your paint to a small, inconspicuous area of the cabinet (like the back of one you hardly ever open), let it cure, then inspect the bonding. If you spot some bubbles in the coat, that means it is not adhering well; consult a paint dealer at your hardware store to pinpoint a more suitable paint for the job. If your first-choice paint applicator for the traditionally flat surface of laminate cabinets is a brush, take a moment to reconsider. These popular paint tools tend to leave an unsightly trail of brush strokes in their wake. Opt instead for a roller, sprayer, or a paint pad for a streak-free finish. Due to the powerful fumes released from the primer and paint (and your close proximity to them when painting laminate cabinets), increase ventilation in the room and keep out children and pets. Lastly, pull on a pair of chemical-resistant work gloves before you go off to paint the town—or perhaps in this case, your cabinets—red!